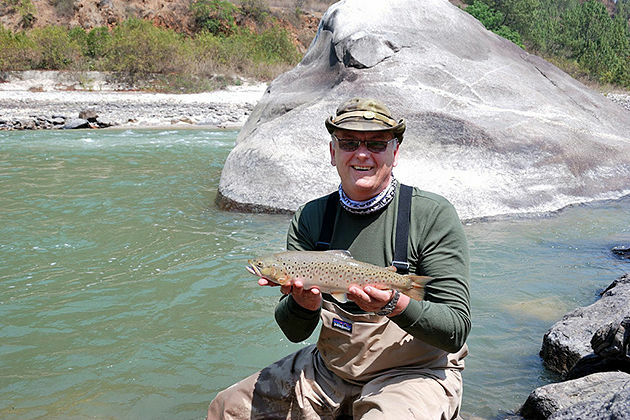 With an 11-day Bhutan fishing tour, you absolutely have a big deal to explore the watering-life in the Bhutanese rivers that are full of species of fish, especially brown trout (also called snow trout) and the Golden Mahseer in southern areas. 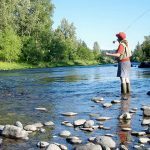 What’s more, besides indulging yourself in the wonderful watering-world of fishes, you also enjoy a scenic cultural tour that leads you to bump into beautiful trout streams, magnificent mountain vistas where the cloud drifted leaving the clear blue sky behind, and cultural scenes from the 8th century intermingle. 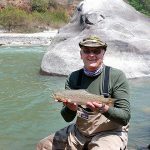 Be ready and give us your hand, then your fishing tour in Bhutan will become one of the most memorable trips you have ever had in your lifetime. Accommodation: Listed below or equivalent. 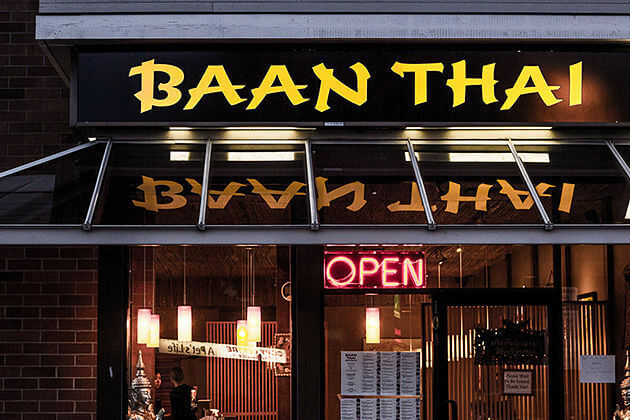 Rooms with private bath or shower, hotel taxes, porterage tips, and service charges. Sitting on a comfortable seat and look through the window, you then witness the stunning view of the Paro Valley, the Himalayas, and the green fields below. After immigration and customs formalities, check out from the departure lounge. 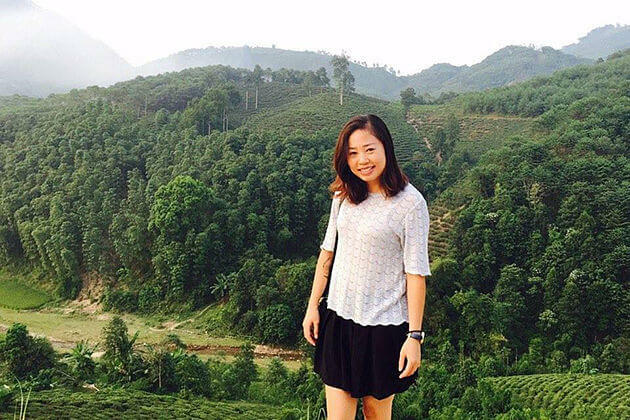 Our representative will be waiting to warmly welcome you and pick you up to your hotel which is a traditional Bhutanese building with a beautiful garden and a tranquil atmosphere for you to let loose. After lunch, there will be an orientation on Bhutanese etiquette and description about the tour itinerary by our guide. In the afternoon, head out to visit Ta Dzong, an ancient fortress which was structured in 1651 as a watchtower for the Runpung Dzong. 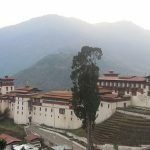 Also, you will visit the National Museum inside the Dzong which converging a huge collection of art, ancient relics, and religious artifacts. Later, in the evening, it’s time to walk along the small Paro Main Street where you will encounter some typically Bhutanese shops and small lodges, and most importantly you will have your own hearty dinner here. Having breakfast, then you are now full of energy to start your first fishing day. 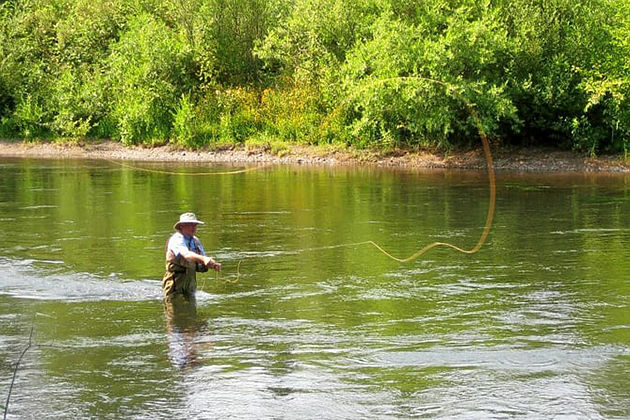 You will be provided fishing gear then proceed towards Paro River and start fishing till lunch. After lunch, drive towards Damchu. 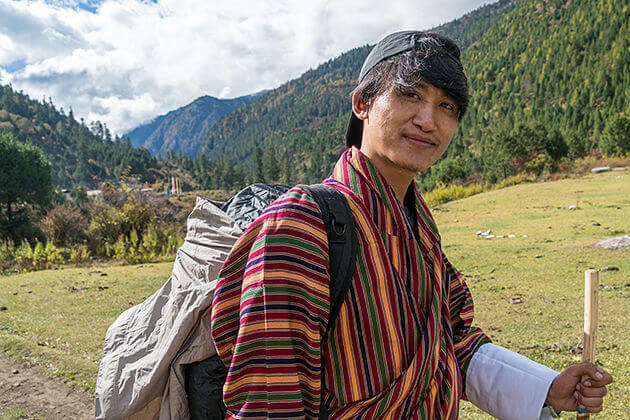 On the way, you can stop to visit Tachogang Lhakhang and listen to the related story about the Tibetan master and the Lhakhang via your knowledgeable guide with a warm voice. Along with that, you will see the 14th-century iron suspension bridge at this location which was built by Thangtong Gyalpo, a great pioneering civil Engineer. Then, you will have a walk on the bridge, from where you can witness the torrential river flowing right underneath your feet. After breakfast, your third day will begin with a 2-hour drive to Haa Valley, a steep north-south valley with a narrow floor. On reaching Haa Valley, you will come across Chele la pass (3810m) dotted with many colorful Buddhist prayer flags offering you a breathtaking vista of Mount Chomolhari (7.314m) – Bhutan’s second-highest mountain, and the green valley below. We then further down the pass to the Kila Gompa Nunnery precariously perching along the rock face. After that, keep walking for a few miles through the coniferous forests before driving downhill towards the stunning panorama of Ha Valley where is an ideal destination for you to stay away from the hustle and bustle of the cities, and also the place where turn you speechless with its incredible ambiance when the sun goes down. However, we come here to go fishing. Our destination will be the Haa Chhu river winding at an altitude of approximately 2700m. 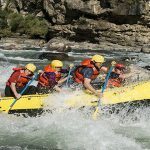 Floating on the boat under the clear blue sky, admiring the river full of fishes swinging their tails, then you will see how pleasant your trip is. 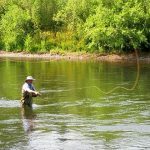 Most common fish that you will find there is brown trout and snow trout. They are not really trophy sized, but still tasty, according to Bhutanese consideration. Enjoy your last few hours exploring the hidden gem – Haa Valley with a great ecosystem converging the diversity of flora and fauna. 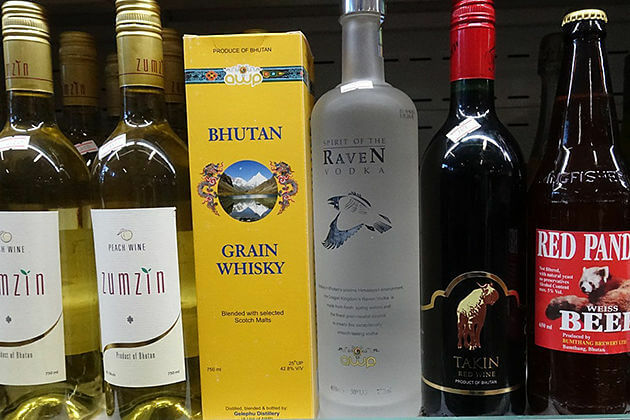 After short sightseeing, you are then driven to Thimphu, the capital city of Bhutan. 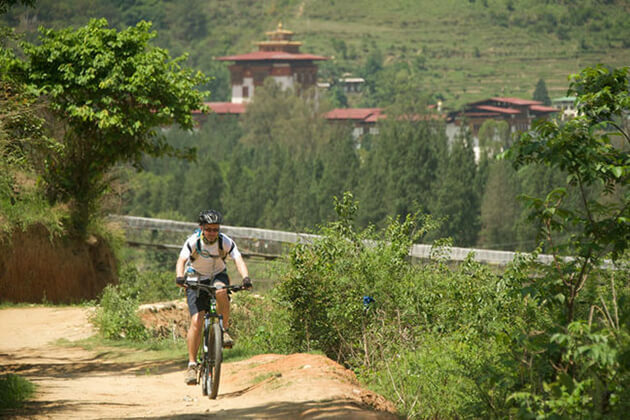 Although it takes you 4 hours to reach to Thimphu, the ride is still much pleasurable through beautiful villages and pine forest as well as passes Dobji Dzong, descends and joins the main road at Chhuzom. It’s time for you to get into watching local farmers sitting along the roadside and selling their vegetable products and dried cheese. Drive further, you will reach Thimphu for an overnight stay. 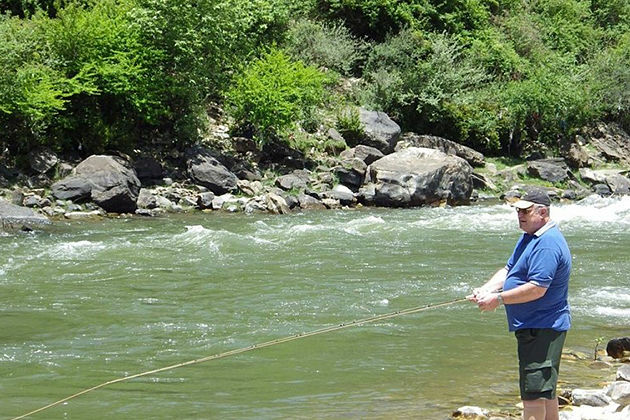 Take a short drive towards the north, you then reach Dodena, one of the most beautiful fishing spots along the Thimphu river where you will spend time on your fishing tour. Your day will begin with a visit to the National Memorial Chorten, also known as Gongzo Chorten or Gyaldren Chorten, and listen to its history. Then the sightseeing trip will continue with the 12th century Changangkha Temple and Drubthob monastery which is home to the Zilukha Nunnery. If you are curious about the national animal of Bhutan, then head to the Takin National Park where you can see Takin, the real Bhutanese national animal. Depends on the time remaining, you then visit the National Library where holds the priceless collections of Buddhist manuscripts and its few English version books, or several places like the Folk and Heritage Museum, Late King’s Memorial Stupa, Traditional Handmade Paper Factory, Painting School, and National Handicraft Emporium. You can also visit the Rinpung Dzong (the fortress of the heap of jewels in Bhutanese language) to witness the painting of the great saint Milarepa who was believed to be the master of the meditation by the Bhutanese. Later, in the evening, ready to participate in fishing at Wang Chhu River. If you wonder why is evening, we will tell you now. 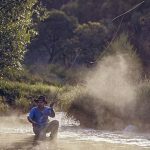 Could you imagine how fascinating it would be when you enjoy an evening fishing when the surrounding things become quiet leaving the crackling sounds of the fish under the cooling water resound when they swing the tails? Having a little chit chat while floating in the middle of the river and that is all the feeling we want to bring to you. Having breakfast then you will set out on a scenic drive to Punakha and stop at the dochu la pass for a while to drink a hot drink. On a clear day, there will be the amazing vistas of the Eastern Himalaya ranges; hence, make sure that you will not miss to witness it. Also, it is great for you to visit 108 Chorten that were built on the dochu la pass with the aim of adding to the scenic grandeur of greenery and mountain peaks. Later, from the pass, driving downhill through the beautiful rhododendron, fir and hemlock forests, then stop at Lobesa and hie through rice paddies to the Chimi Lhakhang temple (the temple of fertility). Once there, you will see something weird on the wall outside the temple (phallic painting) and the interior inside (wooden phallus) but keep in your mind that this is the temple of fertility, these weird things are understandable. In the evening, it’s time to head to the Punakha Dzong (or Pungthang Dewa Chenpo Phodrang – Palace of Great Bliss), the most beautiful Dzong in Bhutan. 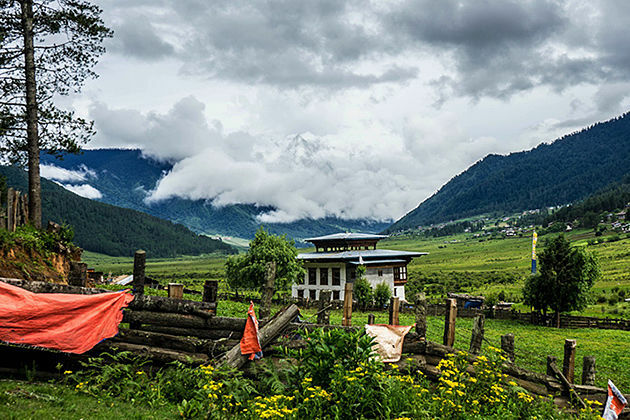 Your 7th day will begin with a drive to Bumthang, the heartland of Buddhism. En route, you will head to Trongsa Dzong, the ancestral home of Bhutan’s royal family, is set amid spectacular scenery. Right after getting to know better about the architecture of the Dzong, you then visit the Dzong’s watchtower (Trongsa Ta Dzong) which was built as a lookout point for defense and security reasons. Also, it converges a collection of antiquities like historic paintings by great Buddhist saints, few items that are the demonstrations of the art and crafts skills displayed by Jigme Namgyel. 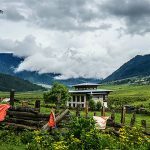 On reaching Bumthang, you will stay in a local farmhouse that provides you the right atmosphere to just let loose and experience a genuine slice of Bhutanese life. Although there will be no hi-end facilities, the accommodation is exactly how a typical Bhutanese family lives in. Overnight at the farmhouse in Bumthang. Having a typical Bhutanese breakfast, then get ready to continue your journey to explore many legendary monasteries and temples. 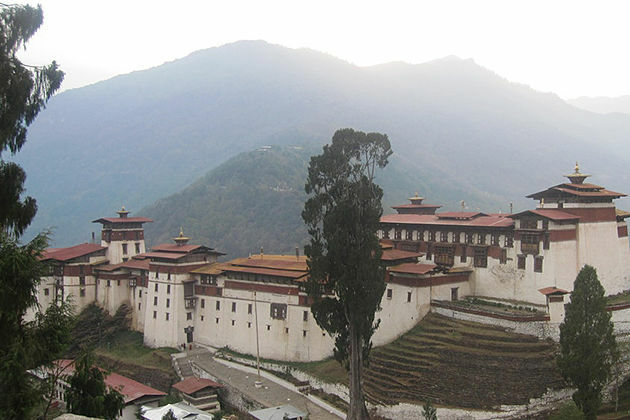 One of them will be the Jambay Lhakhang which was built by the Tibetan king – Songtsen Gampo. 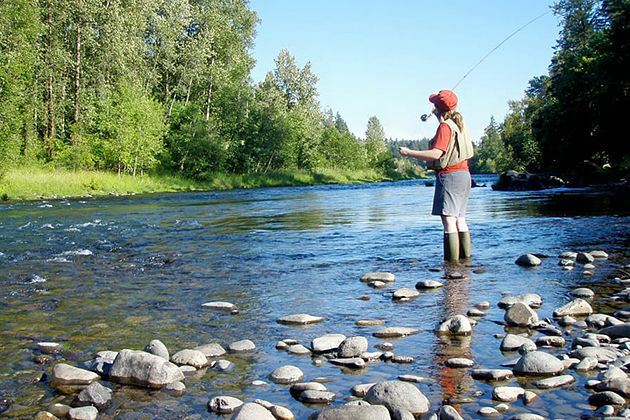 After discovering the ancient and sacred places, you then go towards Mangde Chhu for enjoying fishing. 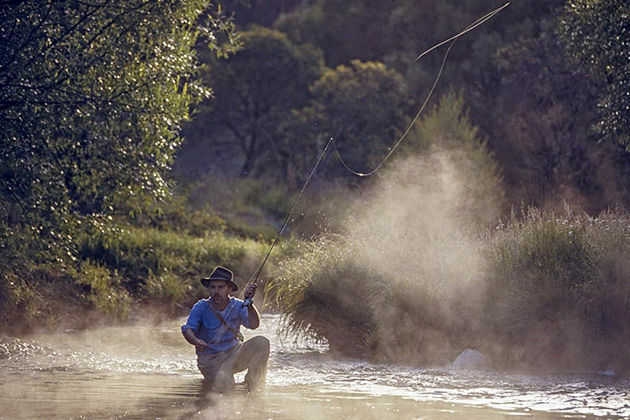 Just like another day of fishing, ready to feel relax and elegant with this activity. Then, if you want to overnight in such a place, camping is required. 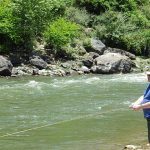 Today, you will take a quite long drive (approximately 6 hours) to the wonderful valley of Gangtey and have an opportunity to marvel at the serene dense forests of Oak and Rhododendron before arriving in Gangtey. Once there, get into the immense vibe of the remote Phobjikha Valley and the Black Moutain. After that, moving onto visit Gangtey Gompa, one of the oldest monasteries, and discover the valley where you can meet the villagers to know better about their lifestyle in the rural area. If you visit this site in November, you will have a chance to witness hundreds of black-necked cranes visiting there after spending their time in Tibet during Summertime. 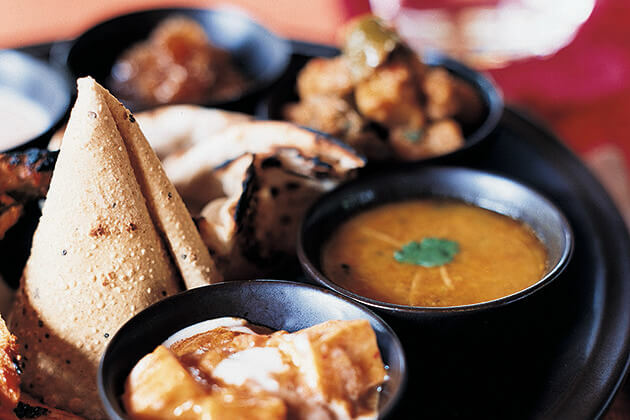 In the evening, it is your time to stroll around the quaint valley and its villages. 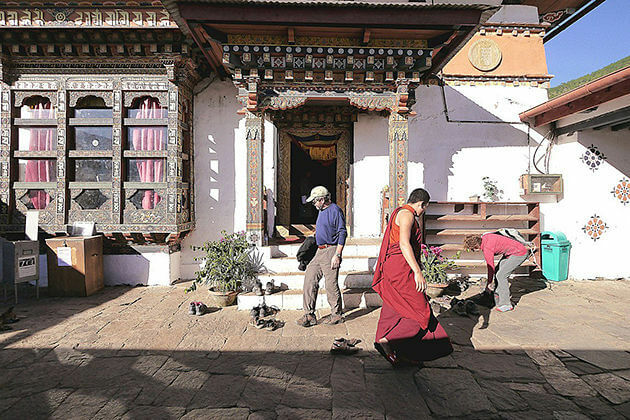 After hiking up to the hilltop village of Rinchengang and get an insight into its history, you then transfer to Paro. On arrival, make your way to visit Paro Dzong, one of the finest examples reflecting Bhutanese architecture. Later, the rest of the day will be yours, feel free to do what you are interested in. Time to say goodbye Paro. Enjoy your last moments in Paro with breakfast at a cafeteria, then you have some time to stroll around the city, do some shopping, or just sit at the cafe and vividly review the whole exciting tour itinerary that you and your beloved partner experienced together. Before 2 hours when your return flight launched, our representative will meet you at your hotel and pick you up to the international airport. The trip ends, hope we can serve you next time in Bhutan.